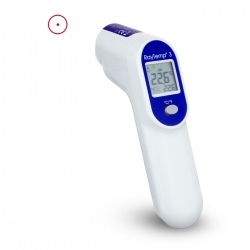 Usually listed on the thermometer, the distance to target ratio, or DTR, tells you the diameter of surface area an IR thermometer will measure at a given distance. Every time you use your infrared thermometer, be sure you either measure or estimate your distance from the target and estimate the diameter of the circle of surface area being measured. 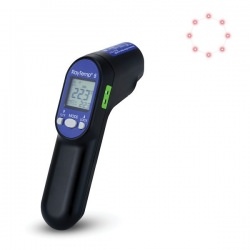 Some IR thermometers have laser alignment to help you make that estimation. Be sure you are only measuring what you want to by standing close enough to your target to keep background elements from affecting the area you ar obtaing a reading from. It is also important to make sure the surface you are measuring does not have large holes like a grate or a grill. 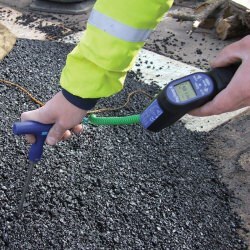 An infrared thermometer will factor in the surface temp of whatever surfaces are visible through the holes when calculating a final temperature for your reading. 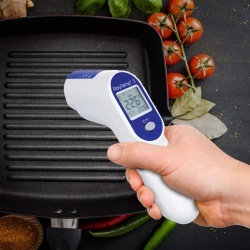 To accurately measure the temperature of a grate or grill, place a solid surface like an iron plate or pan on the grate or grill, let it come to temperature and only then measure the temperature of the plate or pan. * If your infrared thermometer has a distance to target ration of 1:1 or less, it should be held as close to the target as possible.